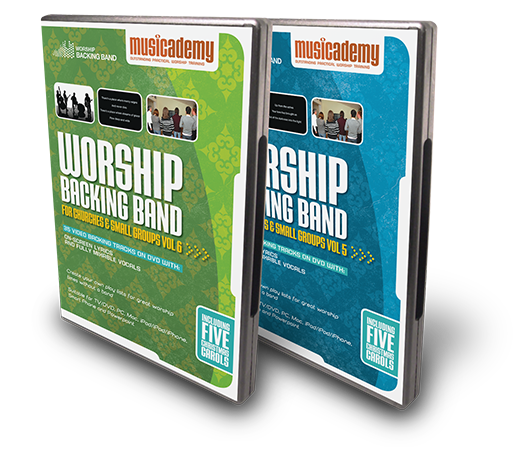 Two new Worship Backing Band DVDs released. The cheapest way to buy Split Tracks. 70 new Split Track backing tracks released on two DVDs. Making contemporary worship accessible, and affordable, in even the smallest church with the least technically adept people, we’ve been delighted to see these DVDs grow in popularity over the years into what are arguably our most successful product outselling even our instructional courses. Worship Backing Band DVDs are quite simply the cheapest way to access backing tracks. Remember that you don’t get all the functionality of our MultiTracks (and the DVD tracks DO NOT play in the MultiTrack Player) but if you want ease-of-use, on-screen graphics and mixable vocals all on a budget, these are perfect. Customers will be delighted with these additional 70 songs to add to their repertoire and for a limited time we are offering the two new DVD volumes with a bundle pack discount. For brand new customers who don’t already have volumes 1 to 4, we have bundled all six volumes together at a great discount. There are 35 songs on each DVD. Pop the DVD into your computer or DVD player and follow the simple instructions to play the songs using your normal media player (Windows Media Player, QuickTime, Real Player, VLC, iTunes etc etc). If you want to create your own Playlists simply rip the songs from the DVD and have them seamlessly flow from one to the next using a computer, iPod, iPad, tablet, smartphone or even Powerpoint. The on-screen words move in time with the music (our words are simple white text on a black background for minimum distractions). If you prefer to use your existing lyric projection system then no problem, simply use the audio from our Split Tracks and not the video element. You can buy either on the Musicademy or Worship Backing Band websites. We have bundled all six volumes together at a great discount. Just want to download a handful of tracks? Rather than buy a DVD full of 35 tracks you can download the individual split tracks via the website. Buy in bundles of 10, 20, 50 or 75 and you’ll see a big bulk buy discount. Previous Previous post: Which two questions are always asked about our MultiTrack Player and tracks?